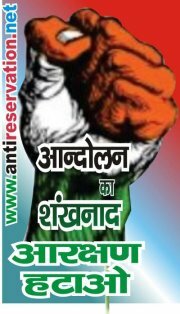 We invite All People to fight against an injustice of Caste Based Reservation on Sunday 5 August 2012 at 10 AM at Jantar Mantar, New Delhi. Please come with your friends to participate in one day "Dharna". Because Forward Class Can't Have Chance to even take part in 50 % of chances in their own country.